Loved. It's a powerful word. Do you feel loved? Do you remember that no matter what, there is someone who loves us, there waiting with open arms? JJ Heller's new album, Loved, gives us all a little reminder. This CD hits stores today. I was lucky enough to get my copy a little early so I could share my thoughts with y'all. I was not familiar with JJ Heller's work until this album showed up, but I became a fan within minutes. I have listened to Loved time and again the past few days. JJ's voice is both soothing and uplifting all at once. The lyrics are powerful and uplifting. I found myself encouraged and at peace while listening to the words. I truly enjoyed this collection of songs. JJ's style is unique. Quiet yet with a bit of a raw edge that I absolutely adore. Check out this video for Who You Are, one of my favorite songs on the disc. 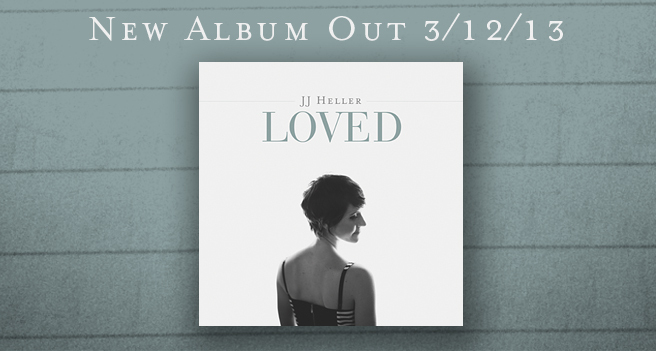 Want a copy of Loved for yourself? I have one copy to give to a lucky reader! Enter via Rafflecopter below.